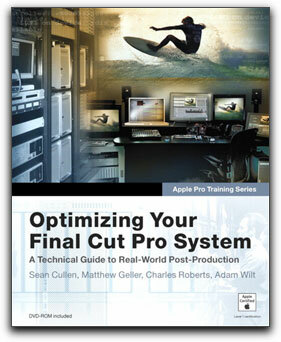 I think the title of this book "Optimizing Your Final Cut Pro System" is a bit of a misnomer. The sub-title " A Technical Guide to Real-World Post Production" is more to the point. At the very start, FCP was mostly Firewire DV. As time passed FCP grew into a completely open-ended NLE, moving beyond DV to accommodate virtually all of the new video formats as well as having the ability to work with film. Of course, with this enormous flexibility, comes a myriad of requirements to handle the multitude of formats that FCP works with. There are different formats, frame rates, frame sizes, pull downs, timecode, Standard and High definition, interlaced and progressive, aspect ratios, online/offline, codecs, data rates, throughput, capture cards, storage solutions, deck requirements, PCI capture cards, external monitoring, Cinema Tools, well, you get the point. The ability of FCP to handle anything that you can throw at it does open a Pandora's box of Post Production questions. Until the release of "Optimizing You FCP System", finding specific answers to these post production questions has been very difficult indeed, a few articles scattered across the web and some discussions at different boards was all there was to provide the many elusive answers to the many questions and concerns which surfaced all too frequently. Given the vast array of new formats, system configurations and hardware options, getting all of this into a single book in a clear and comprehensible manner was the task of four different authors, each one concentrating on their own area of expertise. Sean Cullen (with Estelle McGechie) starts with online/offline workflows for SD, HD and film. The fundamentals of video standards and hardware selection is covered by Adam Wilt. Matthew Geller covers the integration of capture cards, storge devices and Xsan into your FCP system with Charles Roberts taking on the configuring and optimizing of your Mac and FCP, Media Manager and an extensive troubleshooting section. It would be difficult for the reader to absorb all of this information if she were only able to read about it. Many of the chapters contain full lessons that you work through in conjunction with each lesson. 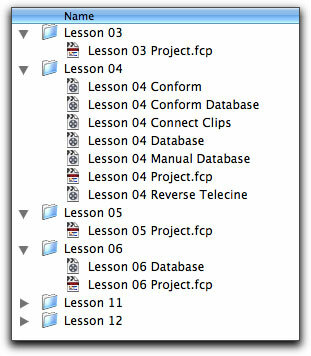 All files necessary to work the lesson are supplied on the DVD ROM and include the lessons, media (audio and video), FCP and Cinema Tools projects. While this book contains an enormous amount of technical information that could be overwhelming, it is not. The information is well organized and folded into clear understandable text that leads you through the workflows. There are illustrations, graphics and tips that further improve the learning experience. Even though there are four different authors, the book flows seamlessly from start to finish, the writing is both excellent and complete. With the included lessons and attending media, the reader is not only presented with the information, but by working through the included lessons, gets to actually perform the tasks and experience the process. Of course, the book is completely FCP centric. As this book is an 'Apple Pro Training Series', it is the official curriculum for the Apple Pro Training and Certification Program. The included DVD contains information on becoming Apple Certified once you have finished the course. 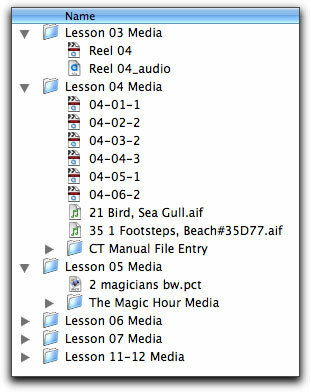 Also included in the DVD ROM are two very helpful PDFs, a 27 page Glossary and a 52 page 'Final Cut Studio Workflows' which includes the processes for 'round tripping' from FCP to Soundtrack Pro, Motion, and other apps in the FC Studio package. Once you decide to move beyond DV for film and video, things can get tricky. Until now everyone has pretty much been on their own. With 'Optimizing Your Final Cut Pro System' we now have a guide to lead us into that brave new world of configurations, codecs, rate rates, pulldowns, capture cards, broadcast and film standards and troubleshooting. It's all here.